All I have to say is thank God for Broadway Joe. If he and his fur coat didn’t show up last night then this already horrible Superbowl would have been that much worse. I’m sure Seahawks fans were ecstatic, but as a casual fan that Superbowl sucked. You knew who was going to win 12 seconds into the game. Joe even tried to hijack the coin toss because he knew how terrible the game was going to be. Peyton Manning and the Broncos got their asses handed to them, and never even tried to put up a fight. 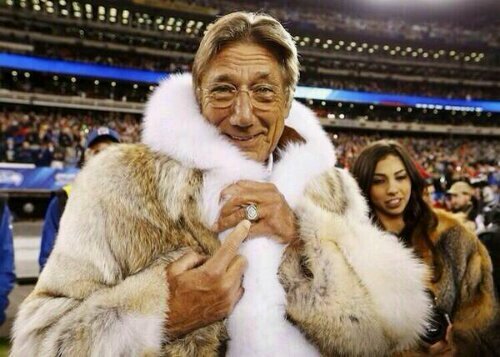 All I know after this game is that Joe Namath has a beautiful fashion sense and as much as it pains me to say it, the Seahawks are far and away the best team in football. Damn it all. Posted on February 3, 2014, in Average Blog Posts and tagged 48, broncos, coat, denver, fur, joe, Namath, seahawks, Seattle, superbowl. Bookmark the permalink. 1 Comment. PETA could not have been happy with his choice of wardrobe and Joe doesn’t give two fucks about them. Love it. Kings do king things.